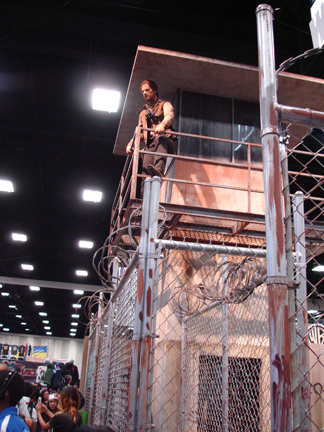 It’s that time of year again…Comic Con!!! Up until a few weeks ago, I thought for the first time in several years, I wasn’t going to be able to attend! 🙁 There had been a snafu with my pass (and I have heard also for many others) so I wasn’t able to get my 4-day pass! I tried the crazy online registration, but of course had no luck. But luckily last month I was able to secure a pass, but only for one day…but what a day it was! Inside, it seems as though some of the booths just keep getting bigger and bigger (and taller!) 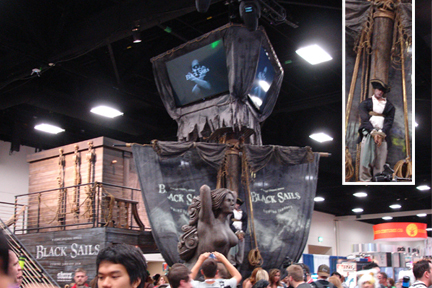 Here’s one massive booth promoting the upcoming TV series, “Black Sails.” Notice the poor guy tied to the mast. That looked sort of creepy! 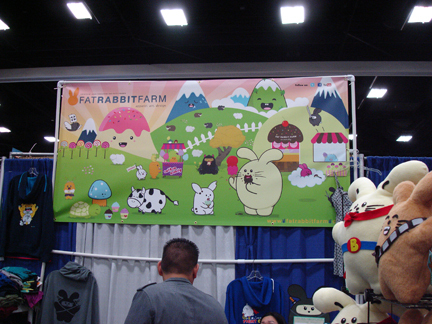 …and I took a shot of this booth, just because I found it funny, random and cute at the same time. Of course I made certain that I stopped by the Vintage Books booth to pick up the newest Fifty Shades button! Last year you had to sort of be ‘in the know’ and ask about the button. This year they had a basket of them at their booth, along with other freebie pens and buttons! Looks like supplies were already going fast by the time I made it to the booth! But there were still plenty to go around and I was able to pick up one for myself! 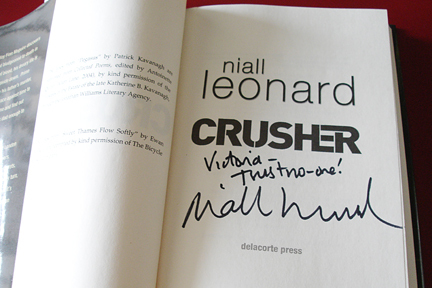 The night before the Con, I had seen tweets about Niall Leonard doing a signing for his book, Crusher. As most of you already know, he is also married to E L James! I had read samples from the book which I really enjoyed, and had heard nothing but good things about it. So, I made sure to jot down the booth number. 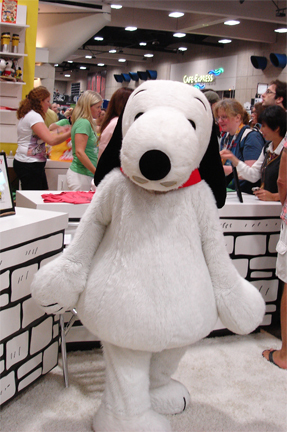 The location was right next to the Vintage booth, but saw no signage about the signing. 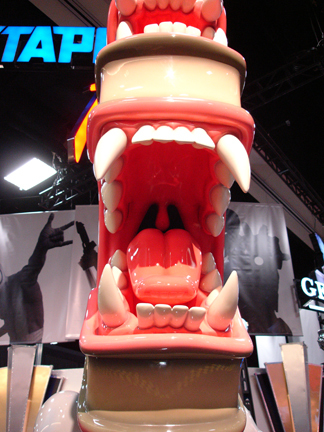 I asked a couple of people working the booth about it. They confirmed that he would be doing a signing, but not exactly sure where. My friends were getting a bit impatient, and it was still a while before the 1p signing, so we left to roam the convention floor. Later I dropped by the area again and asked a very nice man about the signing. He was extremely helpful and showed me where the signing would take place, and that the line would start “right here” and pointed down at my feet and told me I would be first in line! One of my friends was with me and was second! I was very happy and excited, since Mr. Leonard had tweeted that the first 3 people in line would have their names mentioned in the third Crusher book! But things were about to get even more exciting! After the very helpful man walked away to tend to something else, I noticed that standing right in front of me was none other than E L James! He spent a few minutes chatting with me, then was whisked away to his place at the signing table! As promised, he took down my name on a Post-It Note and will use it in the book! We chatted a bit about which name to use…so be sure to buy a copy of the third installment of Crusher to see what Victoria’s fate will be! 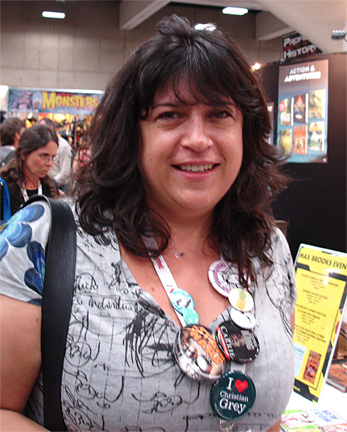 …and a shot of E L James, this time without the hat! I cannot say enough about the two of them! They are both so friendly, pleasant and fun to talk with! 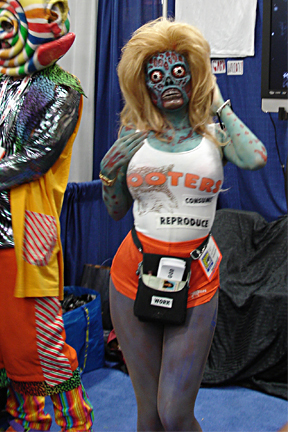 It really made my day at the Con complete! Reading your colorful post, I could feel the excitement and elation as you described meeting and chatting with Mr. and Ms. Leonard. 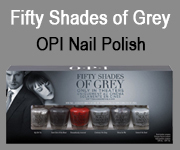 I’m sure you were thrilled to meet the lovely “muse” for your FSoG portfolio. 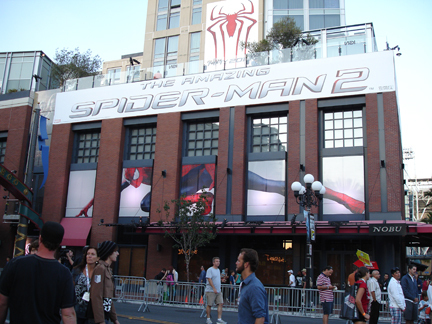 I suspected that both Niall and Erika would attend SDCC this year. I think it’s wonderful they enjoyed beautiful San Diego this week, as well. Thank you so much for sharing your experience and photos. But, Victoria…why the shyness? How wonderful for you! Good to hear all your details and the pictures. My heart is full of nothing but pleasure for you and your works. I am glad you got to meet El James and her husband. That was something, I’ll bet. 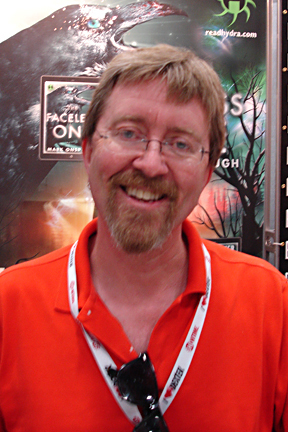 I hope you someday get to meet G. E. Griffin, the “other side” of the Grey books. Thanks again for sharing your VERY SPECIAL day! You’ve had a few of them lately, haven’t you? 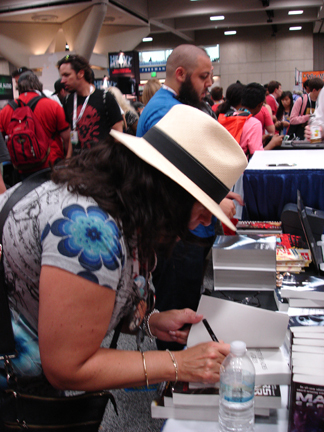 That is wonderful you got to go Comic-Con and interesting how you ran into EL James & Niall Leonard….mmmm. I have never commented to anyone on a website before (other than Facebook, that doesn’t count), but I just had the “gut” feeling about your work! Keep it up!!! Oh, I so envy you got to go. Thanks for taking pictures. 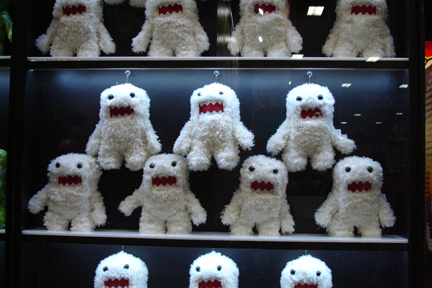 I felt like I was there too. Hi Christine! Hahaha! I have had some very exciting moments occur lately, that’s for sure! 😉 I’m really flattered that you came out of lurk mode to comment here! I’m usually a lurker as well, so I really appreciate it very much. 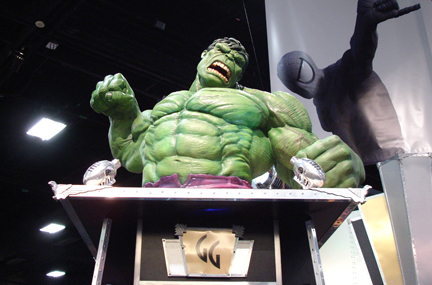 Attending the Con this year was full of surprises. As I mentioned, I was convinced I wouldn’t be attending for the first time in several years. But, surprise after surprise seemed to pop up after being lucky enough to finally secure a pass. 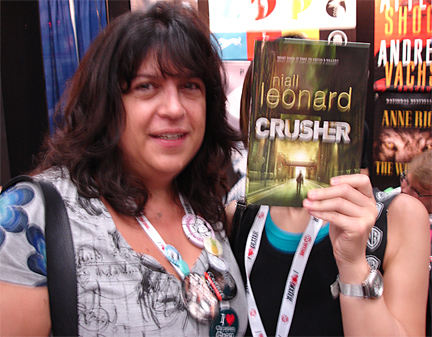 The opportunity to meet and chat with E L James and Niall Leonard in that environment was unreal. I think the fact that they are so friendly and make themselves accessible had a lot to do with it. They just seemed like they were there as a fan as much as everyone else! Very nice recap! And I’m thrilled you met Erika and Niall. Even more thrilled to learn your name will make it into Niall’s third installment! How cool is that? You got me a pin, right? As always, I love your writing and I felt I was there with you. Sounds so awesome and I’m glad you had a great time.